There were quite some minutes of video material left from the Kafireas Strait and after I had finished the video of the whole voyage some days ago, I thought it would make sense to compile an additional little video just showing the crossing since most sailors are interested in seeing how a boat behaves in rough weather. 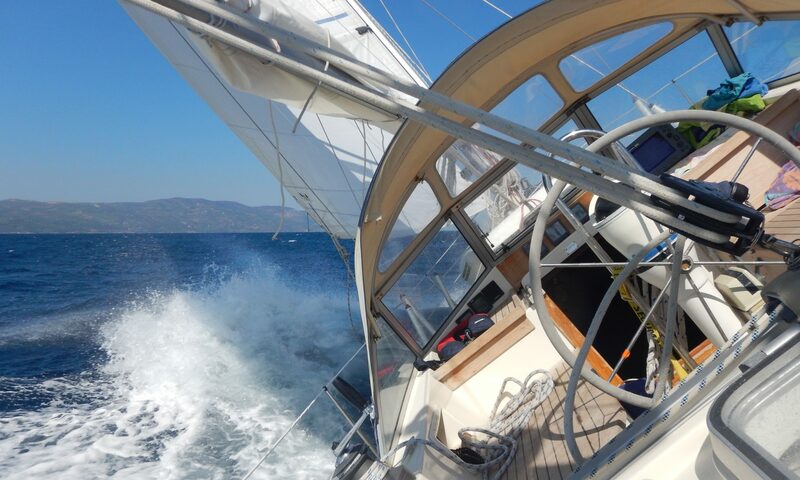 The Aegean sailing trip is completed now. 16 days onboard Matilda with a lovely and highly motivated and skilled crew made this voyage more than just great fun. Day passages of more than 60 miles where not a problem and although we stayed in harbours for sightseeing and because of bad weather for three days, we finally logged 480 miles on the whole trip. We started in Matilda’s homeport Khalkoutsi where we left early afternoon together with my friend Franz and we sailed with two boats to the sliding bridge of Khalkis which we passed at about 11:00 pm. On the way north the next day, many dolphins came across and stayed for a long time playing at Matilda’s bow. We anchored overnight just around the northwest tip of Euboea Island where the tidal current was reaching about 4kt and the water was freezing cold. After a stop at Oreoi we sailed to the islands Skiathos, Alonissos and Peristera, which is one of the islands of the Marine National Park of Alonissos (http://alonissostravel.com/national-marine-park/). The Anchorage at Vassiliko/Peristera was quite exciting because of the shipwreck of the freighter Alonissos. The freighter was wrecked some 10 years ago in a violent storm that drove it onto the rocks, despite having two metal chains secured to the rocks and two anchors on the sea bed. We sailed further north to Kasandra/Khalkidiki where we met some old friends and finally into Porto Karras on Sithonia for shelter because of the bad weather that was on the way. The phenomenon was extended and unusual for the time of the year with heavy thunderstorms and massive rainfalls (the Sporades further south got half of the average annual rainfall in just two days!). The temperature dropped to 17C and it rained for 24 hours but we were well protected in Porto Karras. Patrick joined the crew the next day and we sailed south to Kyra Panagia and Skyros where we also met our Friends Franz and Rolf again. The harbour staff in Linaria/Skyros was very friendly and professional. They helped us mooring stern to in a relatively narrow space by holding Matilda’s bow with the help of a dinghy. Because of the Aegean Rally stopping here next day we had to move to the permanent mooring field a bit further NW of the harbour Linaria for the following night which was a good choice and a very well protected spot from the still strong going wind. The following passage through the Kafireas Strait was one of the highlights of the voyage. A steady F7 gusting to F8 was pushing Matilda and she was surfing the waves reaching sometimes more than 8 knots through the water. Being a more traditional long keel design she is quite happy with such conditions and felt safe all the time. When we reached Batsi/Andros, the wind was still blowing at F7 even into the harbour. There were only 4 other yachts there and we were happy to go alongside at the inner side of the peer. After an Island exploring and sightseeing day on scooters the next day, we left for Ormos Fikiadha on Kythnos, just about 1NM NNW of the main harbour Merikhas. We were surprised to see about 50 other yachts in the two bays which are separated by a longish sandy beach when we arrived late in the afternoon. There was still space though and anchoring was not a problem. Although I had the feeling that I had lived for more than a month onboard now, days were passing quickly and there was only one night left which we spent at Petalioi Nisoi after a nice passage northwards. The last day finally was sailing home and it didn’t feel right… I could go on like this for months and years …but time has not come yet. Many thanks to my crew who helped making this voyage such a nice experience!